Celebrations are underway with The Capri Theatre at Goodwood screening the newly restored Oscar-winning 1964 film version of My Fair Lady, in style, for the film's 50th anniversary on New Year's Eve. This new breathtaking restoration is described as looking more "lovelier" than ever. Costing more than 1 million dollars, a whole new digital restoration frame-by-frame from the original 65mm negative with a new 8K scan and a full 4K restoration. Over six months approximately 12 million glitches in the film's images, including dust, scratches, tears and splices were removed by computers. If you are wondering what that all means, well a regular Blu-ray player displays only 2K of resolution. So My Fair Lady with the latest improved technology, will look and sound very much like what Eliza Doolittle would call "positively loverly". When Saturday, 31st December, 2016 from 7.00 pm you will be made to feel welcome in the licensed piano bar in The Capri Theatre foyer. 7.50pm - Cartoon and Featurette. 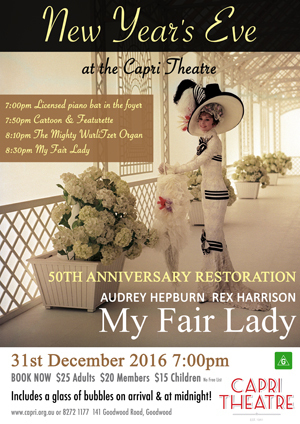 The screening of My Fair Lady will finish at approximately 11.45pm when the fireworks display in Sydney will be presented on The Capri's screen while you welcome in the New year with a glass of bubbly. Your ticket includes a glass of bubbles on arrival and at midnight. 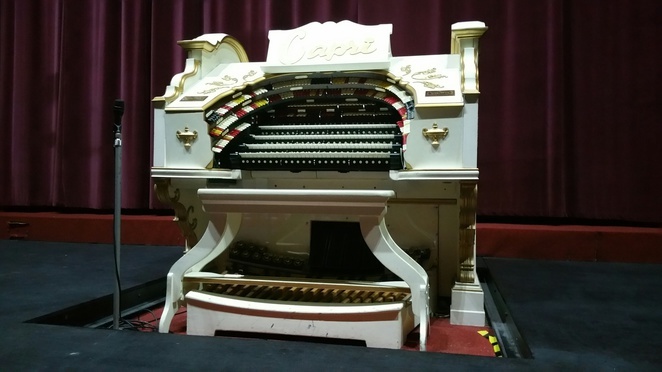 Enoy listening to the mighty Wurlitzer organ. Why? Enjoy a wonderful evening to greet in the New Year watching this beautifully restored movie in a entertaining and relaxed environment.